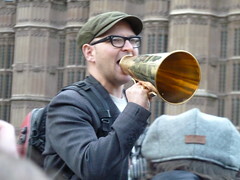 If you know who Cory Doctorow is, chances are, you’re a geek or a nerd. Or both? It’s hard to tell, depending on how the term’s being bandied about this week. Anyhow, science fiction author and BoingBoing co-editor Cory Doctorow is giving at the the New America Foundation on “How Copyright Threatens Democracy“. The issue isn’t a simple one, and comprises a complex discussion of the role of the creative in business, as well as the legal rights to publish material, something that’s coming to an interesting head in the next few years as newsprint media continues its retreat. As books and music and movies expand to take on new forms, what will Copyright do? While I frequently disagree with Doctorow, it’s hard to argue that he’s not one of the most knowledgeable people in the world concerning US Copyright laws. Come out, it’ll be neat. Your BoingBoing link is wrong. It’s .net.